Back in the fall of 2014, producers Jason Blum and Michael Bay turned a board game into a low-budget sleeper hit with Ouija, which earned $103.5 million worldwide from just a $5 million budget. While the original thriller was set in present day, the upcoming follow-up Ouija: Origin of Evil takes us back 50 years, as you can see in the first trailer and poster. 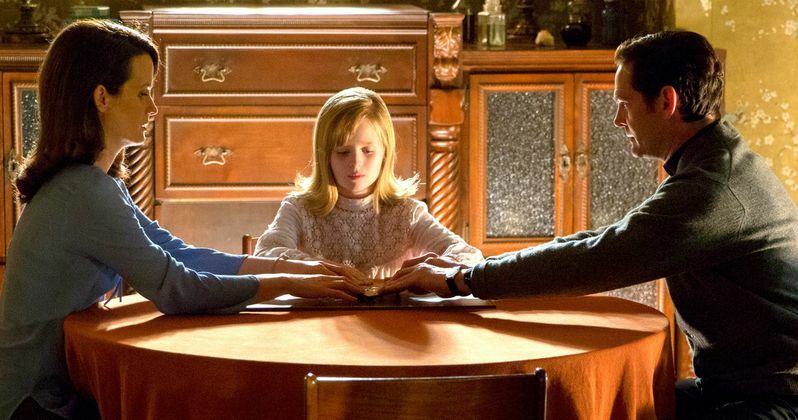 Inviting audiences again into the lore of the spirit board, Ouija: Origin of Evil tells a terrifying new tale as the follow-up to 2014's horror blockbuster that opened at number one. It was never just a game. In 1965 Los Angeles, a widowed mother and her two daughters add a new stunt to bolster their séance scam business and unwittingly invite authentic evil into their home. When the youngest daughter is overtaken by the merciless spirit, this small family confronts unthinkable fears to save her and send her possessor back to the other side. Ouija: Origin of Evil has been given an October 21 release date, which is shaping up to be a very competitive weekend. Also opening on that date is Jack Reacher: Never Go Back, A Monster Calls, Keeping Up With the Joneses, Boo! A Madea Halloween and I'm Not Ashamed. Elizabeth Reaser leads a cast that includes Henry Thomas, Doug Jones, Lin Shaye and Annalise Basso. Ouija: Origin of Evil is produced by Platinum Dunes partners Michael Bay, Brad Fuller and Andrew Form, Blumhouse Productions' Jason Blum, alongside Hasbro's Brian Goldner and Stephen Davis. Mike Flanagan directs from a screenplay he wrote with his Oculus and Before I Wake collaborator, Jeff Howard, and Universal will distribute the film worldwide. The October date was originally being reserved for an untitled Blumhouse horror movie, which was the last of 3 Blumhouse thrillers announced back in 2014. Universal will handle distribution, as it did on the original. We don't know for sure if this sequel will have a similarly miniscule budget like the original, but we'll have to wait and see. This project will mark the second horror franchise from Blumhouse that Lin Shaye is involved in. She stars as Elise Rainer in the Insidious franchise, and she actually helped announce the Insidious 4 release date in a special video last month. Take a look at the new trailer, courtsey of Youtube, along with the poster and first photos for Ouija: Origin of Evil, and stay tuned for more on this thriller.